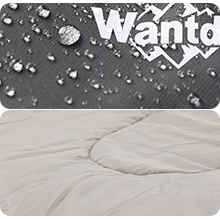 Wantdo sleeping bags with polyester fabric and hollow cotton filling, it is designed for cool and cold weather, sleep comfortable with temperatures between 17.6 and 59 degrees Fahrenheit. Wantdo sleeping bags are designed to ensure you have a great and relaxing night’s sleep after a tiring day of trekking, hiking, travel or any other exploration. 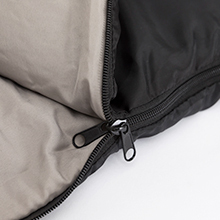 Comfortable and Lightweight: Envelope shape sleeping bag, with the same size for shoulder and feet,offer maximum comfort, warmth and freedom.Wantdo sleeping bags are designed to ensure you have a great and relaxing night’s sleep after a tiring day of trekking, hiking, travel or any other exploration. And the package size is about D10.2x14.2inches, the weight is 3.97lb. Weather resistant and Size fit: (1) Within cotton filling, sleep comfortable with temperatures between 17.6 and 59 degrees Fahrenheit - cool & cold weather (spring, autumn,winter). (2) Fits Most Heights - Dimensions with 74.8 x 29.5 in., it’s perfect for persons up to 6 ft. 2 in. (boys, girls, women, men, adult, teen, child, kid, boy, girl, children). Features: (1) With one pillow that gives you more comfortable night's sleep. (2) 2 slider zippers with pull provide more convenience. (3) Velcro design that fix the zipper to keep the wind out. (4)190T polyester outer offer waterproof and wear-resisting; 210T polyester pongee is soft for your skin. (5) S shape quilting sewing that fixes the cotton filling inside and adds warmth. 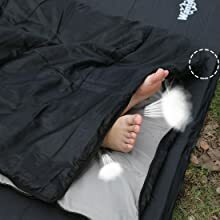 Excellent ventilation and free your feet: Unzip the sleeping bag at the feet part that you can put your feet out of the sleeping bag, provide good ventilation and freedom. Multi-functional: The sleeping bag can be fully unzipped and unfolded, you can use it as a mat or blanket. 190T polyester outer offer waterproof and wear-resistant; 210T polyester pongee is soft for your skin. Unzip the sleeping bag at feet part, this provides good ventilation allows your feet to move freely. 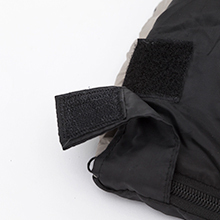 Velcro design covers the zipper to prevent cool air from coming in. 2 slider zipper makes it easy to get out of sleeping bag.